In September 2006, a British platoon in the Kajaki region of Afghanistan is making a routine patrol and encounters a minefield in a wadi. With several casualties and no prospect of an immediate evacuation, they make do with the personnel and medical supplies they have at their disposal. It's been a while since I have said Wow at the end of a movie. 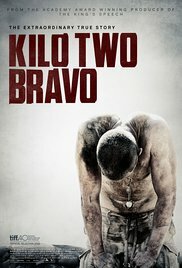 Kilo Two Bravo is a war movie, and among the most realistic I have ever seen. I don't have artsy standards when it comes to war movies; I don't think, unlike most people, that Saving Private Ryan is among the best war movies ever. I have never been able to watch war movies with the same eyes after seeing Black Hawk Down, Special Forces, or Zero Dark Thirty. Kilo Two Bravo, being based on a true story, certainly belongs in my Wow category. A movie about a platoon that encounters enemy fire is nothing new, but when a movie reflects the scary moments of war that follow absolute boredom, then that's worth watching because you know is the real deal. Kilo Two Bravo puts in perspective a book I read relatively recently, The Shadow Patrol written by Alex Berenson, who spent time in Afghanistan to gain insight about soldiers' day to day life in a war zone. Interlaced with desperate humor, Kilo Two Bravo ably depicts the horror of war, and the sacrifices made by men and women in the military to defend the freedoms we take for granted in the Western world. The ladies who typically read this blog will probably shy away from this movie, but I urge the men in their lives to give this movie a try; if it doesn't make them cry at least it will make them think. I don't typically watch war movies. I grew up watching a war on the television news every night and that sort of blunted my appetite for them. Funnily enough, my husband, who served in Vietnam, seems obsessed with documentaries about war on TV and is perfectly open to a good war movie, so perhaps he would enjoy this. This is a great one. If he decides to give it a try, and I hope he does, let me know how it goes. I don't shy away from war movies. My husband likes watching them so I tend to have seen quite a lot. I've not heard of this one so will let him know what you think. Great, Lynn. Let me know if you watch it and your thoughts on it. I just now finally watched the movie adaptation of Fail-Safe, so I might have to take a break before I see this one. But your review is very convincing. My husband & I see quite a lot of war movies so I will likely see this one soon -- because of your positive review. I had not heard of it. thanks. It sounds intense & penetrating. Oh, it is, no doubt about it. Let me know what you think once you watch it.